...we're under construction!" I'm not sure how many times I've said this since the first of this year. In all honesty, I might miss that excuse when I no longer have it. After all, it has made my life easier. Didn't make the bed this morning. No problem. "We're under construction." Didn't do the dishes last night. "We're under construction." Didn't fold the clothes in the laundry basket or clear the papers off the table before company showed up. "We're under construction." Do you see where I'm going with this? When you are in construction mode, it doesn't matter if your house is a mess. And even though the things I mentioned have nothing to do with the construction happening on the main floor, I still get away with that excuse. Everybody understands! I mean, why clean up when you are just going to have a puff of drywall dust finely coating everything the next day anyway? After all, life is about more than just cleaning up those everyday messes. Your home is built to "live" in and life is messy! So, remember, the next time you have some unexpected guests show up and the house isn't looking just right, say, "Excuse our mess, we're under construction." When your guests question what you are actually constructing, all you have to say is, "I'm building a life." Trust me, they'll understand. Welcome Home. Fast forward to this week where we have seen our drywall going up. The third coat of drywall mud is going on the seams as we speak and the look of the house is really starting to change. It is amazing how recessed lighting can modernize the look of any space. We have almost every inch of flooring pulled out on the main floor, and we are working on getting the baseboards and trim pulled off in the rooms that didn't need new drywall. New windows are coming next week along with the kitchen cabinets. Once we get the green light that the drywallers are done, we will be pushing to get the kitchen and laundry area painted to stay ahead of the cabinet installers. Don't be surprised if I'm sporting some paint highlights in my hair when you see me in the next couple of weeks! Now, comes the issue of where to stop with the trimwork. We have one area of our kitchen where the carpet was literally glued to the plaster wall in the place of wood trim. I scraped for an hour on that glu-ey, sticky mess last night trying to make it so the drywallers might be able to skim coat over it and even out the imperfections. The rest of our existing trim was installed with an overabundance of 2.5 inch finish nails, which caused the brittle wood to split in several places as we were removing it and also left big holes in the plaster that isn't getting replaced. We were warned that the fellow who built this house never intended for it to come apart, and that is no joke! They should use our building materials to line the vault of Fort Knox! Unfortunately, trimming is tedious and exact work that requires precise cuts to get everything to fit just right. I'm going to warn everybody right now that our house will be the one that you come to 5 years from now to find that the trim still hasn't been installed. We've all been there before! For those of you who were concerned that you hadn't heard about the house for a couple of weeks, we are still alive and we are still married. 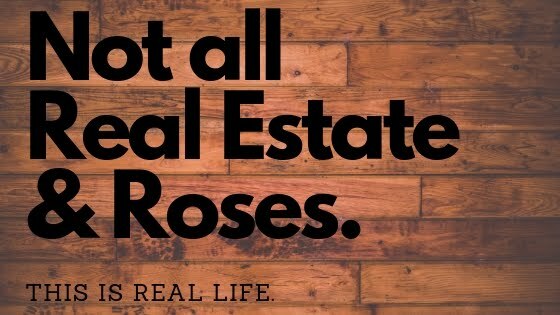 On a side note, I had the privilege of sharing my real estate experiences last weekend at a women's conference, and I think the attendees enjoyed hearing that we are all in the same boat when it comes to making a house a home. The important thing to keep in mind is that these things don't happen overnight. It is so rewarding to see the progress being made at home each and every day. My husband even admitted earlier this week that he has stopped dreading coming home each night (I'm still not quite sure how to take that comment). For the time being, I'm going to assume he means that although he loves his wife, it is hard to come home each night and be faced with the daunting task of putting a puzzle back together again while living at the mercy of contractors, deadlines and other commitments. ;) Just remember, despite what happens each day, life does go on. You'll get through it so long as you remember to take one step at a time and enjoy the little victories. Welcome Home.